How many times a day you feel like that your life is monotonous and that you want to get away? If it is more than once, it is time to take yourself to the snow-capped mountains and rich cultural tours in Pokhara, in order to find a fresher and more spiritual meaning to your life. Located in almost unearthly scenery with a resilient lake and snowcapped mountains in the distance, Pokhara is the perfect to recharge your batteries that died down from constant work and fatigue of everyday life. Pokhara has a vibrant culture filled with hardworking, friendly and spiritual people who are always ready to treat you with a smile or delicious cuisine inspired by Tibetan culture. If you are visiting this little village and city combo next to the lovely Phewa Lake, you should definitely participate in one of the cultural tours in Pokhara which will take you into truly getting to know the life and the ways of the people living in this beautiful country. What Is Covered by Cultural Tours in Pokhara? Even though Pokhara is situated a good few hours away from the capital Kathmandu, there are many organized tours you can take there. With the beautiful peaks of Nepal that you can see everywhere, one of the biggest ways you can enjoy the culture there is by participating on a trek. If you are an experienced trekker, you can attempt a longer trek such as Annapurna Conservation Area. If you like shorter hikes which give you great sceneries, you can opt for Sarangkot Sunset Tours which will give you a stunning view of sunrise over snowcapped mountains of Nepal. There are many home stay experiences covered through cultural tours in Pokhara which will give you a chance to stay with a local family, witness and understand their daily routines, enjoy home cooked meals and truly live like a local and get an experience of a lifetime. Nepal is, and Tibetans are naturally spiritual and peaceful people. You will learn many important things which you can adapt to your own lifestyle such as finding peace in what you do and always being happy, polite and generous. For a more specific spiritual experience, you can go for yoga or meditation based cultural tours in Pokhara which will help you truly find your inner peace surrounded by beautiful mountains, the picturesque Phewa Lake and the kindest people you will ever meet in your life. These yoga and meditation experiences are often done by locals and monks themselves, which will give an authentic experience of truly practicing and living a spiritual lifestyle. All of these cultural tours will be done by local guides who are experienced and extremely helpful to assist you in any way you will need in exploring their country. 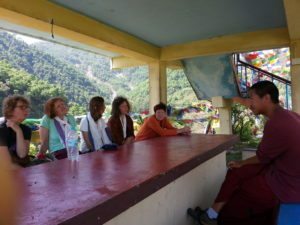 Seeing and being involved in the Tibetan and Nepali culture will surely make a profound change in your life both mentally and physically, and you will surely return home as a better and rejuvenated person.